Sculptra is one of today’s most popular choices for correcting facial lipoatrophy (facial fat loss). Since 1999, it has been used around the world in over 30 countries and hundreds of thousands of men and women have experienced amazing, natural looking results. Scultra is FDA approved for treatment of skin creases, wrinkles, folds, scars and eye rings caused by lipoatrophy – and the results are safe, effective – and enduring. Dr. Yeh tailors each treatment plan to meet the specific, individual needs and goals of each patient. Sculptra, also called poly-L-Lactic Acid, is a synthetic injectable material that has been used medically for years in dissolvable stitches, soft tissue and other types of implants. After being injected below the skin, in targeted areas of fat loss, there is a gradual increase in skin thickness. This occurs over several months and after 3-6 treatments, but the results are long-lasting and natural looking. Dr. Yeh is recognized as an Expert Injector for Botox and fillers. 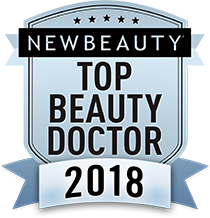 He is among the top 3% of physicians who qualify for this prestigious honor as recognized by the American Academy for Aesthetic Plastic Surgery and American Society for Dermatologic Surgery. Any man or woman who wants to restore a natural appearance to the face by restoring fullness and facial volume – could be an ideal candidate. Dr. Yeh can determine during your personal consultation if Sculptra would be right for you. You should be in otherwise good health and be capable of having realistic expectations. Using a fine needle and pre-measured doses, Dr. Yeh injects Sculptra into the targeted areas needing volume replacement. All types of injections can be a little uncomfortable but Dr. Yeh is experienced in performing all injection treatments and uses techniques to keep you as comfortable as possible. A local or topical anesthetic may be used also. Regardless, some bruising, swelling and tenderness at the injection sites may occur and is normal. This resolves on its own over a few days and can be easily camouflaged with mineral makeup.